Don’t let foot or ankle pain stop you from moving! Dr. Peng and his staff will help get you back to your favorite activity so you can continue to enjoy life without pain and discomfort. At Align Foot & Ankle, Dr. Peng and his certified staff provide extensive foot and ankle care for the whole family. If you’re experiencing any pain from a deformity, sports injury, warts, ingrown nails, sprain, or other uncomfortable issues, the team at Align Foot & Ankle can provide a variety of services that will get you back to what you enjoy doing. There are many reasons that can cause our feet to hurt from ingrown toenails to heel pain to injuries. Find out some of those conditions and more here. Got nagging pain in the ankle? Is it from a past injury or is it something else? Find out more about your ankle pain here. Our office uses a variety of treatments that are available to get you back quicker depending on your condition. To learn more about kind of treatments we offer, check here. At Align Foot and Ankle Center, we treat all our patients like family. From the moment you walk in our doors, we aim to make you feel welcomed and comfortable. We respect your time, which is why our staff works hard to get you in to see Dr. Peng as quickly as possible to minimize wait times. However, during the exam, we take our time with each of our patients, ensuring they have asked all their questions and fully understand the possible treatment options. Patients continue to return to our office because of our warm bedside manner, our ability to listen, and for the exceptional care we provide. A highly-effective way to help relieve pain and improve everyday performance by creating custom arch support molds to help treat conditions such as plantar fasciitis, arch pain, or flat feet. As an athlete, your feet are vital to your performance and we specialize in treating sports-related injuries and rehabilitation to get you back on your feet and back in the game. If surgery is the only option to treat your foot or ankle condition and get you moving again, you can trust you’re in good hands with Dr. Peng. We can surgically repair deformities such as bunions, cysts, spurs, or fractures. Suffering from a sprained ankle can be quite painful and that’s why you can trust us to evaluate and determine the severity of the sprain and focus on the best way to get you back to full strength. Ingrown nails are a serious issue and without proper treatment, they can become a burden to your everyday health. We make sure to evaluate and determine the right procedure that will eliminate the pain and make your feet feel brand new. Warts found on your feet or ankle are nothing to avoid. We make sure we find the right treatment that will remove the wart and make sure they don’t come back. We offer radial shockwave therapy which utilizes sound waves to treat trauma and inflammation. This therapy is effective for the treatment of plantar fasciitis. If you’re suffering from a chronic injury, a common treatment is a Platelet Rich Plasma (PRP) injection. We draw your blood and take the plasma and inject into the injured area to help strengthen the area and get you moving again. It never hurts to get a second opinion on any issue you have with your foot or ankle. If you’re feeling pain and a past diagnosis or treatment isn’t working, we can help discover the root of the problem and find a solution. Don’t let a foot or ankle injury hold you back from your best life, trust Align Foot & Ankle to get you the care you need. Book an appointment online by calling (805) 482-0711. Dr. Hai-En Peng was born in Nyack, NY and attended kindergarten there before moving to Oak Ridge, TN. 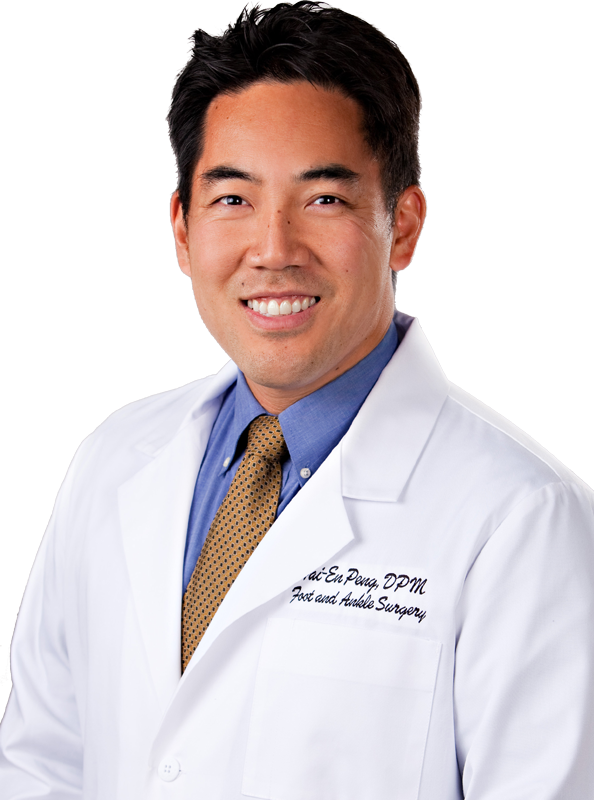 After graduating high school, Dr. Peng went on to attend Emory University and received his Bachelor of Science degree in Chemistry before getting accepting to the California College of Podiatric Medicine in San Francisco, CA. He spent the next 4 years there and graduated in the top 15% of his class. He decided to stay in the Bay Area to complete a 3-year advanced surgical residency in reconstructive foot and ankle surgery.